BE HEARD ON ANY SIZE BUDGET! You don't need a large budget to get big results with PPC Marketing! Increase the amount of visitors to your website for only pennies! HIGHER CONVERSION RATES. LOWER COSTS. WE HAVE THE RIGHT COMBINATION. Net Gravity is a 100% Canadian company, and we understand the unique challenges Canadian businesses face when marketing online. We can make your uniquely Canadian business successful online, ask us how! PPC MARKETING Want more potential customers coming to your website today? FIX MY PPC CAMPAIGN Is your PPC Campaign costing you money OR making you money? 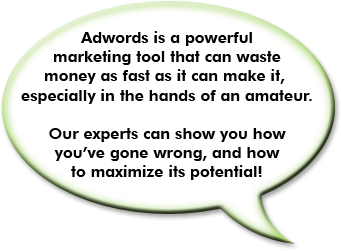 24-POINT PPC AUDIT Plug the holes in your PPC campaign with our exhaustive 24-point audit. 24 million Canadians search online each day for every product and service there is, including yours. Is your web site on the first page of search results? Are you the number one result? If your web site is not number one, there could be multiple reasons why and you need a partner with the proven experience to define and explain those reasons. With a decade of "in the trenches" experience in assessing and applying search engine placement solutions, Net Gravity is the cost effective choice to move your business to the top of the first page of the search results. Chances are you've spent thousands of dollars producing a good looking web page but if qualified and targeted traffic to your web site is not there, it is nothing more than a glorified business card. “NEVER BEFORE IN THE HISTORY OF MARKETING HAS A BUSINESS BEEN ABLE TO PAY AS LITTLE AS A FEW CENTS TO CAPTURE THE UNDIVIDED ATTENTION OF CUSTOMERS...”We can institute changes to your website that will result in immediate and tangible results that can be tracked and turn your web site into an effective and significant growth tool using our proven approach. We will ensure your web site is accessible to customers the moment they express interest by keeping your company at the top of the search results, when they are motivated and looking to buy your particular product or service. Net Gravity can apply customized, cost effective solutions immediately. Customers never stop searching – you don’t have time to waste! It’s time to move your business ahead of your competitors now! Great PPC Management. Better than the companies that are on those "Top PPC Management Company" lists that you find through searching on Google (I know this because the last company I hired, was from that list). “ NET GRAVITY KNOWS THEIR STUFF, ARE VERY EFFICIENT, WHICH MEANS THEY CAN DO MORE THAN MOST OTHER COMPANIES CAN DO.” Learned that I did myself a disservice by not doing my own due diligence when I hired the last company. Anyways, Net Gravity knows their stuff, are very efficient, which means they can do MORE than most other companies can do = better results. You're paying for management, and I get DAILY reports with Net Gravity, when other companies had said that they "didn't have enough data to provide short term updates" -- which is a lie. It's just that it wouldn't be PROFITABLE for them to. Net Gravity does everything I need them to do, and I have a lot of faith that they will be able to help increase business for us, and make things more effective & efficient. Don't make the same mistake I made before... if you're thinking about a new management company, hire another one -- Hire Net Gravity! Due to the down turn in the economy and new business getting hard to find we decided to take steps to get our name out into the market place to promote our products and services. Net Gravity was the first to contact and meet with us giving a comprehensive approach to internet marketing. “ NET GRAVITY BEGAN OUR CAMPAIGN ON A THURSDAY AND BY THE FOLLOWING MONDAY WE HAD CLOSED TWO NEW BUSINESS ACCOUNTS, VALUED IN THE THE THOUSANDS OF DOLLARS. ” Net Gravity began our campaign on a Thursday and by the following Monday we had closed two new ongoing business accounts, valued in the thousands of dollars. The traffic to our website grew exponentially and we have had great response from our advertising campaign. We are extremely satisfied with Net Gravity and their business approach. It worked for us and I am sure it will work for you. I have dealt with many outsourced teams and it is a fact that it can be frustrating. Fortunately, Net Gravity is a breath of fresh air! “ THEY HAVE EXCEEDED MY EXPECTATIONS, AT ONE POINT THEY WERE ABLE TO REDUCE OUR SPEND BY 40%!” Great communication, Experts in their field, professional and a joy to deal with, not to mention the awesome results they produce. Net Gravity has done a tremendous job on our PPC projects. They have given me confidence that PPC works, they are able to hit our goals and reduce our spend. They have exceeded my expectations, at one point they were able to reduce our spend by 40%! We expect our campaigns to continuously prosper, we will always use Net Gravity for future projects. © NET GRAVITY INC. ALL RIGHTS RESERVED.